You guys know the Poconos is one of my favorite weekend escapes from the city! It’s cute, it’s close and has a burgeoning foodie scene that is not to be missed. I spent a lovely weekend there in partnership with Pocono Mountains Visitors Bureau to get in the spirit of Halloween! Check out some of the highlights from the trip below! We stayed at Settlers Inn, a quaint property that sits on six acres of land and is bordered by the Lackawaxen River. It was built in 1928 and boasts a garden and farm-to-table restaurant with an award winning wine list. It’s the perfect place to relax for a weekend, eat way too much amazing food and enjoy the stunning views. The Halloween highlight was the Storytelling Dinner. The week before the dinner they host a Pumpkin Carving, where over 100 pumpkins are intricately carved then set on display around the hotel. I could spend hours exploring the unique, creative designs that are lit up all over the hotel and dot the tables in the Storytelling Dinner. We indulged in the decadent Fall inspired menu as a storyeller regaled us with spooky Halloween tales. The next day we took the long, scenic walk to the up to the Hawley Silk Mill. It’s a former silk and textile factory that now houses a coffee shop and assortment of local shops. I wish I had planned to do some shopping because there were so many lovely candles, body butterss, crafts and home decor waiting to come home with me! After a bit of wandering, we headed down the road to Ledges Hotel, a chic, modern property at the base of a natural river gorge fall. It has a stunning bar called Glass, with unforgettable views of the river Fall and a great menu of wine and tapas. It started raining so we stayed inside with a bottle of wine for a bit, then headed back to Settlers. The weather wasn’t really conducive to exploring, but Lake Wallenpaupack is supposed to be quite a stunner. You can have lunch at The Dock at Silver Birches and take in the views. And be sure to take the scenic route back to NY on Route 6. 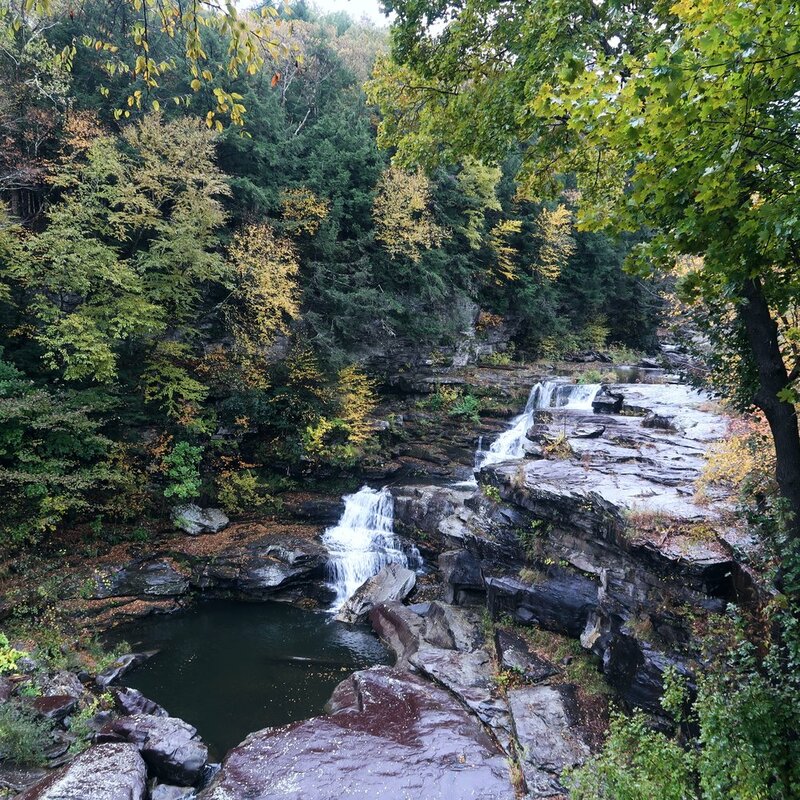 You can explore the charming town Milford and stop by Raymondskill Falls or GreyTowers National Historic Site. If you are thinking about a late Fall or Winter weekend getaway, definitely make the trip up to Hawley! Check out the Pocono Mountains Visitors Bureau for everything you need to plan your trip any time of year, but especially for next year’s Storytelling Dinner! 3 Ways to Travel More in 2019! The Best Bodysuits of the Season!